A phenomenal headline. In some ways it is even stronger than the original Aldrich Ames (see below): Aldrich Ames Remix still retains DEFCON win possibilities (it is usually an instant win if the US is holding Lone Gunman), and even if you don’t get to win by DEFCON, you do get to discard the best US event in their hand (ideally a scoring card) and see the US hand for the rest of the turn. All in all, it makes Aldrich Ames Remix one of the best USSR headlines in the Late War, especially since it’s almost impossible to backfire or be mitigated. This is typically painless if you play it in your last action round, and in fact is probably a boon as you can use it to discard a strong USSR card (or even a bad scoring card), reminiscent of the USSR Five Year Plan trick. It is not advisable to play Aldrich Ames Remix before your last action round. US player must display his/her hand. USSR player then orders the US player’s cards. US player must play hand in that order. US player may not play The China Card for the rest of this turn. 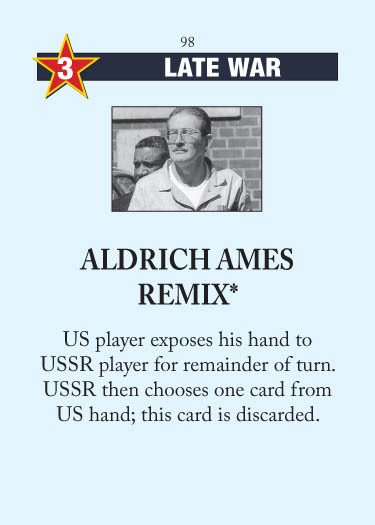 I don’t recommend playing with the original Aldrich Ames, the simplest reason being that it is hugely time-consuming as the USSR will likely spend quite a while planning out their turn to calculate the best possible order of the US cards. It also cripples the US decision-making for that turn and is a generally unpleasant experience (especially if it ends the game). This entry was posted in Late War, USSR Events and tagged aldrich ames remix. Bookmark the permalink. Haha. Sounds like something out of Command and Conquer: Red Alert. Seriously, though, I’m finding that this rulebook’s flavor text is rife with errors. I already corrected some, but there are apparently many more. Such a cracking event for the USSR! Surely a candidate for the “key event for you to draw instead of your opponent” award — Glasnost would be worth a mention in that category. Voice of America would be #1 on that list. Well, certainly it’s a no brainer for the USSR — straight to space, no questions asked. A good reason for not space-ing too liberally early on as Soviets. But Ames can be a game winner. VOA is the only card in the game that is never, ever played for ops, by either side. One side always plays it for the event, and the other always spaces it. That’s not true of any other event. I guess you’re wrong. Scoring cards are also cards that are never, ever played for ops, by either side 😉 On the other side, either side sometimes neither spaces nor plays VoA for the event. Instead, they just use it to discard from Quagmire/Bear Trap. To be honest, I’ve never seen played John Paul II Elected Pope for ops. Okay, well, besides scoring cards, willing discards, and forced discards, I think it’s the only one. I’ve definitely played John Paul II for ops as the US, because the Soviets had massive overcontrol of Poland, and as the Soviets, because I had massive overcontrol of Poland. Technically, Grain Sales to Soviets should be the least-Opped card, because by definition it is always better for the US to play it for the event, and when was the last time you saw a USSR willingly play Grain Sales? But yes, it is clearly GSTS or VOA. Soviets could theoretically play GSTS with an empty hand at little cost, which they could not do with VOA. I once had board when I played Grain Sales for ops as USSR as the last card in my hand because it was the last AR in the game (Aldrich Ames plus doubled Terrorism cut US hand) and I saw that no matter what, US cannot change scoring with 2 Ops while USSR, given the opportunity of the last control-break, could. Technically US should never play GSTS for Ops. The point is – GSTS is defcon suicide card – USA can coup MidWar Battleground, thus droping Defcon to 1 and ending the game. They cn do this even if USSR’s hand is empty, as they can conduct operations with op value of GSTS itself. Forgive my inorance but how is this a Sefton suicide card with lone gunman? It makes sense if corrected to : “Aldrich Ames Remix still retains DEFCON win possibilities (it is usually an instant win if the US is LEFT holding Lone Gunman)”. I.e if the US has LG and one other card left, discarding this other card will (if defcon is at 2) lose the US players the game. If the US doesn’t have the China Card, then discarding a card means that they must play every card in their hand by the end of the turn. So if they have Lone Gunman and don’t have any way to safely get rid of it (which the USSR can see), then they wind up forced to suicide on AR7. Question: If I play Aldrich Ames as headline, can I (in case my headline goes first) nullify the US headline? Because technically the US headline is already played and therefore not ‘in hand’ (this might be my answer, but I’m just checking). Yes, the US headline is not in the hand any more for Aldrich Ames Remix (or Cambridge Five, for that matter).